I was spending more and more time in Norway for the MRES mostly based out of Trondheim. From time to time newspaper articles appeared in the local press describing the work conducted by the MRES in the local regions. 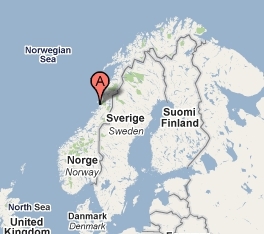 The following is a rough English translation of one such article involving myself that appeared in the regional Norwegian Brønnøysunds Avis newspaper 9–April–1946 as a result of a visit to the Norwegian coastal village of Brønnøysund (see map below). An English search and rescue officer visited Brønnøysund (Norway) last Saturday and Sunday. The English pilot, who was found in January 1942 at Sklinna and brought to Brønnøysund via the "Skarv" and buried as unknown, has been excavated and identified. His name is J. B. Drury, sergeant and navigator. The Germans apparently had not touched anything on the body. The pilot still had his navigation watch on his arm. Lt. H. Brooks was very grateful for the honor which was shown the deceased pilot by the population by setting up and the laying of wreaths on the grave. Following his wish, the pilot will be moved to the old churchyard near the Russian tombs. An English grave commission will soon visit the place in order to view the grave. H. Brooks also visited the remains of the plane that was downed on the 27th of October 1944 after having sunk a destroyer in the Torg Fjord. Some fishermen found the remains of the plane at 8 fathoms depth at Småvær and brought up parts that were carefully hidden from the Germans. The markings showed that it was one of the latest and most modern "Firefly", armed with guns. Two guns now serve as a support under a barn on Burøya. One still does not know the fate of the pilot who saved himself by parachuting. He was twice saved from death, first with the parachute that was on fire when he crashed on a U–boat which was so heavily bombed that a large number of the German crew was blown to bits. Probably there were several men in the plane. Possibly it is one of these victims who was found a month after on Hysvæøyan by Toralf Ingebretsen. He stated that the pilot was in a blue double buttoned uniform with overalls over top and assumes that his name was E. Walter Rudel. He may be an American pilot, according to Lt. H. Brooks. It will be verified and solved by the English Air Force. This pilot was picked up by the "Norøy" and brought to Brønnøysund under orders from the German commander. Whether he was sent further on is not clear. At the merchant Norø a large wheel from a plane was kept which had sufficient characteristics for identification. A similar wheel that is found by Jørgen Ebbesen, Toft is located on Ertenbrakan. Lt. Brooks assumes that these wheels come from a huge Lancaster bomber that was lost in this area. Two of the strong crew are buried in Nesna. The first wheel was found by Jon Sandøy just outside Torget. Lt. H. Brooks is very interested in messages from people who have found or seen parts of the British and American planes. He is particularly interested in a large bomber that disappeared in January 1945. 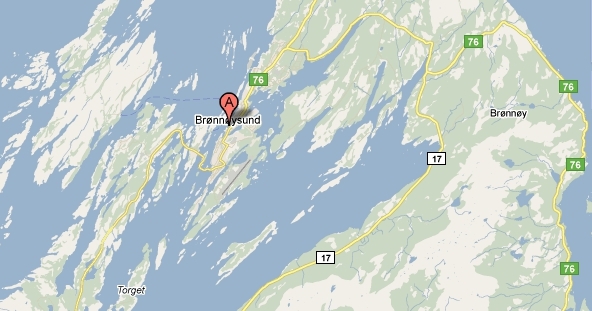 Anyone who may have something to report, please contact the Lensman (sheriff) in Brønnøysund. The British (Editor: Brooks was Canadian not British) officer said that many relatives of pilots in England still believe that their loved ones are still alive. Therefore it is important to bring forth the information about the plane along and its crew and whether it was totally destroyed, and hopefully be able to say when, and preferably say where the victims are buried. Lt. H. Brooks states that the identified pilot probably will not be moved from Brønnøysund. This is certainly the same wish as held by the people. The following supplemental information has been kindly provided by Linzee Druce of Scotland Ref: 6.24. The text in the passage below are the recollections of the pastor in Brønnøysund. It is taken from "Blad av Brønnøy historie 2007" (a yearbook from Brønnøy historielag) from an article "Sør-Helgeland 1940-1945" by L.U.Pedersen -it was from a lecture he gave in Brønnøysund on April 20, 1990. L.U.Pedersen passed away 1998. He disappeared with a Lancaster bomber plane 16th November 1941 and was the only one of the crewmembers who was found drifting in the sea near Sklinna in Leka (Kommune). He was identified on the 31st August 1946 by F/Lt. Hubert Brooks who came to Brønnøysund to search for remains of lost aircraft (and crewmembers). We travelled to the islands. There we were shown a couple of machine guns that a fisherman used as supports for his quay. The serial number. was found for use in the identification of the plane. The grave with the unknown airman was opened with the church warden Eliot Evjen, and the gravedigger, Arthur Larsen. F/Lt. Brooks had brought a statement for opening the grave. The airman was so to say ‘vacuum-wrapped’ in a tarpaulin, the Germans who brought him from Sklinna obviously hadn’t opened the “package”. The body had his airmans jacket with observers watch on his wrist, and the ID-tags around his neck were still in place. Thanks to the ID-tags, his identity could be established, and later reported to me. In respect of the dead airmans sacrifice for our country, church warden Evjen and I decided to move the coffin to the oldest cemetery, where we chose a location close to the stone fencing on the southern side of the western entrance. I remember that we sang “Closer to you, my God” the British F/Lt. sang it in english (Editor's Note: Hubert Brooks was Canadian), and finally we said the Lords prayer together, and received the blessing. The weather was strange, some drizzling rain in east, and a glowing sun low on the western sky. We then had the joy of watching a full rainbow from east to west. The highest point of the rainbow appeared to go straight through the church-steeple. The reason that we chose that location was the celebration of the national memorial days in the future. The British War Graves Commission later wanted to move the grave to a central place for practical reasons. I was able to stop this. The grave of the airman was taken care of in Brønnøysund until priest Høiseth found that it was better that he was moved to Trondheim. There (in Trondheim) the coffin was re-interred at Stavne cemetery, along with 155 British soldiers. I was in contact with the airmans mother up to her death. It was natural for me, since the airman had been churchwarden in his congregation in Lancaster (Linzee Druce NOTE: The airmans hometown wasn’t Lancaster, but Preston, Lancashire.) His name continued to figure on the front page of the congregation newsletter up to the information of his death was given to his mother in 1946. The lighthouse keeper at Sklinna had written a report about the discovery of the airman. Through the British embassy, I sent this report to his mother too. In the vicarage archives, a folder with the letter including letters from his mother should still exist. Further details received May 2008 by Linzee in a mail forwarded by Lisbeth Terje of Brønnøysund who received it from Steinbjørn Mentzoni. (Translation to English from Norwegian version). The airman was onboard one of the Wellington type 1C bombers that bombed Kiel on the 19th of November 1941. 47 planes participated, and 4 were lost. They came from the airfield MARHAM, that still is in use for British planes. If the person contacts them, it surely should be possible to get more information. Since the airman was wearing a lifevest, it is possible that the plane had ditched, or that the crewmembers had parachuted over the North Sea, and Jack has been caught in the gulfstream current and ended up here. I don’t know where he was found, but hardly near the pier in Brønnøysund. As an example I can tell that in old days the people on the island St. Kilda near Scotland seet out small bootshaped wooden boxes with pleas for help. Today the now inhabited island has a radar station. Some of the radar personell sent out similar “boats” and one of them was found by a 12 year old girl not far from my hut at Dønna island. The man travelled with the coastal steamer some months later, and we then met him. Back to the plane: There was also an attack by 49 planes on Emden at the same time as the attack on Kiel, 4 of the planes were lost there too. This is what I have so far. Wellington IC R1135 HA-N from 218 Squadron took off 22:43 Marham on op to Kiel. Crashed in the North Sea. Apart from Sgt Drury, who is buried in Trondheim (Stavne) Cemetery, Norway, the crew (see list below) are commemorated on the Runnymede Memorial.